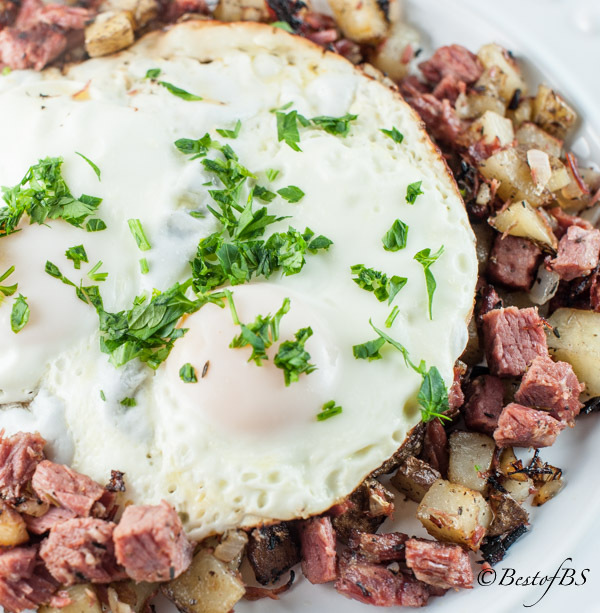 Corned Beef Hash just happens to be one of my very favorite breakfast foods, and this is the best Corned Beef Hash I have ever had. Beside being the best, it is so easy! Hope you love it as much as I do! 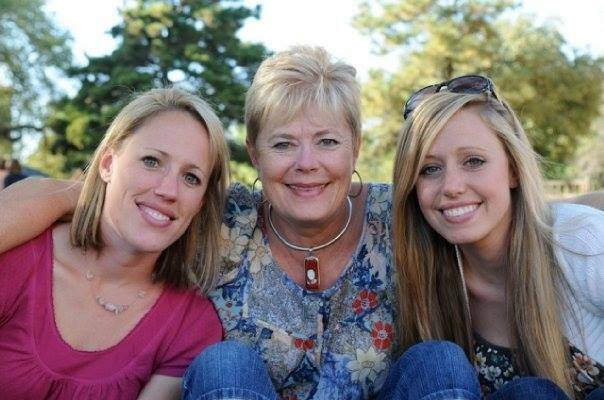 It is my intention to blog about each and every trip we take, but it seems like “things” are always getting in the way. Before I’m able to get one trip posted, it’s time to leave on the next trip. It always seems pointless to write about the trip that has already happened. I have come to realize for me, it is almost impossible to post about a trip when I am on it; so, I’m going to start posting our trips after they happen. In June, we traveled to Las Vegas for the Opinion Leaders’ Forum. It is an Endodontic meeting sponsored by Dentsply, a dental supply company. The host hotel was the Four Seasons Hotel, which we absolutely fell in love with. It is very quiet and it has a beautiful, relaxing atmosphere. 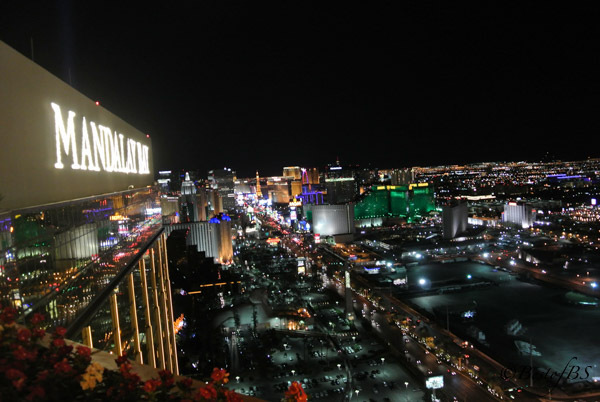 Interestingly enough, the Four Seasons’ rooms occupy the 35th to the 39th floor of the Mandalay Bay Hotel. The fact that the Four Seasons’ guests use the Mandalay Bay casino, keeps this hotel quiet and smelling nice. We had an awesome room that had an amazing view of the mountains and the strip, which I must say, is beautiful lit up at night. Wondering how the Corned Beef Hash fits into this post?? Well…as it’s one of my very favorite breakfast foods (beside all Mexican breakfasts, BLTs with onion and a fried egg and fresh fruit with plain Greek yogurt and granola…always with lots of coffee! ), it is actually one of the foods I use to judge the quality of a breakfast restaurant by. One morning, I Googled “Best Restaurants for Breakfast in Las Vegas”. On almost every website, the buffet at the Excalibur came up as one of the tops. As it is also close to the Four Seasons, Joel and I decided to try it. Even the bellman at the Excalibur who we asked for directions to the buffet said it was the best buffet in town, or he wouldn’t be working there. Well, he needs to be looking for another job. It was the worst!! Do not ever eat there!! And…the Corned Beef Hash was horrible! It was the canned variety that looked like dog food loaded with very tiny diced potatoes that barely held together. How anyone can eat that garbage is beyond me!! It’s like eating Spam. FYI: If a restaurant says their Corned Beef Hash is not homemade, this is most likely what you’ll get. Stay away from it!! Order something else!! 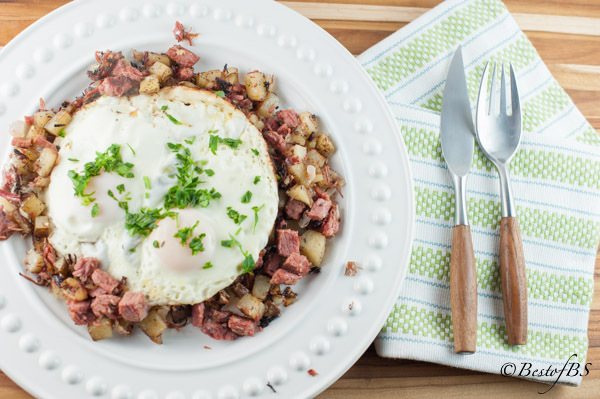 So…here is an awesome recipe for a proper Corned Beef Hash. 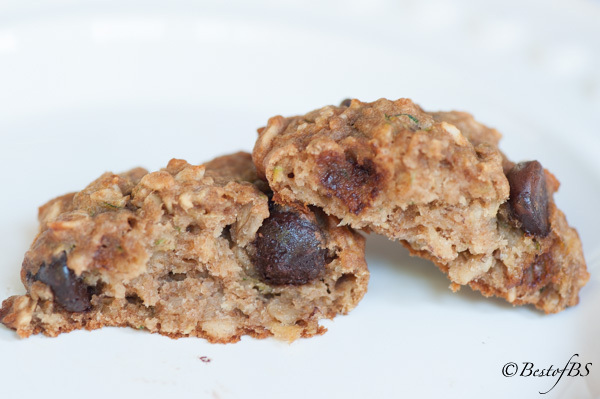 It is soo tasty and, as an added bonus, it is super easy! 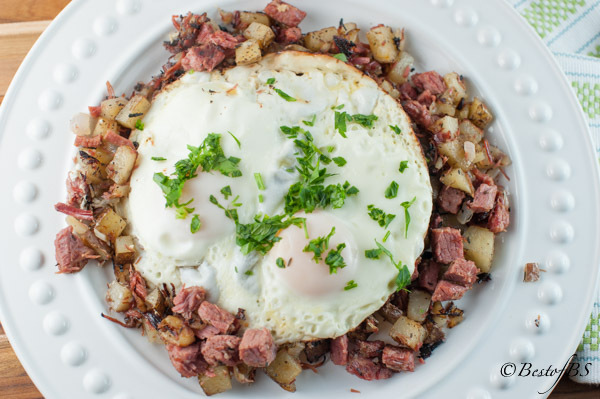 My favorite way to serve Corned Beef Hash is plated, with Eggs Over Medium on top. 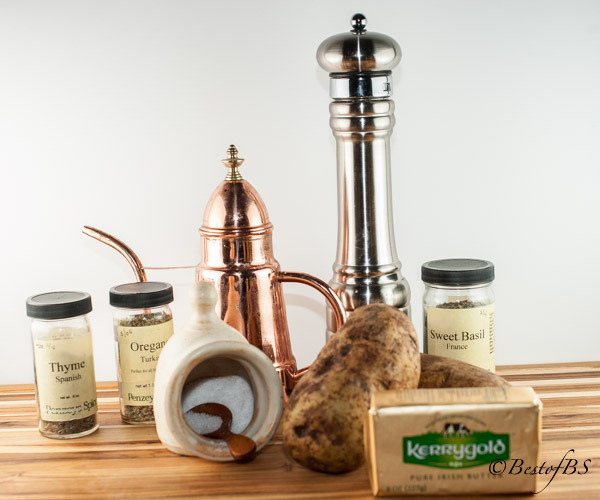 These are some of the staple ingredients you will need for my awesome Corned Beef Hash. I almost always use this Kerrygold butter that is pure, fresh Irish butter made from grass fed cows. It is the best! 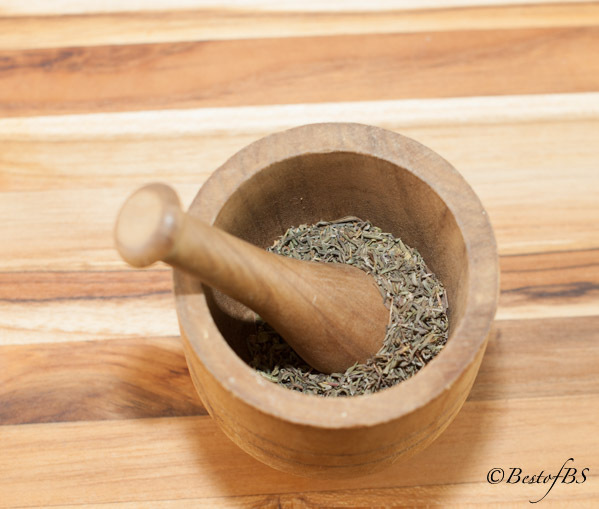 I love using this small, wooden mortar and pestle to coarsely grind spices which releases the oils for added flavor. 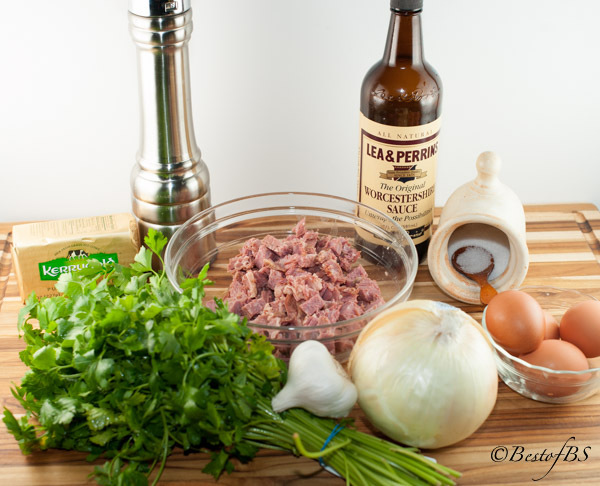 You will also need Worcestershire Sauce, Flat Leaf Parsley, onion, garlic, corned beef and eggs. This is the size you need to dice the potatoes. Not too big, not too small. Toss them with the seasonings and olive oil. 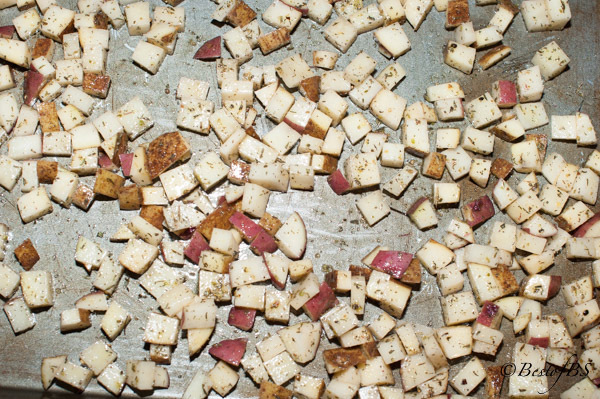 When you put the seasoned, diced potatoes on the cookie sheet, make sure they are spread out as much as possible. Make wells in the hash and crack one egg into each well. Then cover the pan and cook the eggs to the desired doneness (I prefer over medium, Joel likes his over easy). Sprinkle coarsely chopped Flat Leaf Parsley over the top and serve. Lightly spray a cookie or baking sheet with nonstick cooking spray (I use Pam). 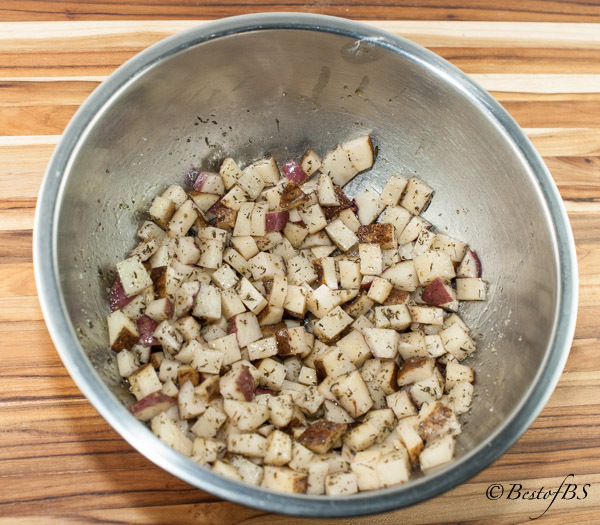 Place the diced potatoes in a large mixing bowl. Add the olive oil, thyme, oregano, basil, salt and pepper. Toss until the potatoes are evenly coated with the oil and the seasonings. Spread the seasoned potatoes evenly on the prepared baking sheet. Roast in the preheated oven about 18 to 20 minutes, or until the potatoes are lightly golden brown and crisp. Set aside. When the skillet is hot, add the 2 tablespoons of butter. When the butter is just melted, stir in the garlic and onions. Stir in the seasoned potatoes and Worcestershire. Cook about 3-4 minutes to allow the flavors to develop. Taste for seasonings and add salt and pepper if necessary. With the back of a large spoon, make 8 wells in the potato mixture. Serve immediately. If desired, garnish with the chopped parsley. great recipe and photos Brenda. forgot to rate the recipe! !